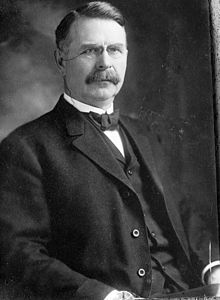 Charles Russell Davis (September 17, 1849 – July 29, 1930) was a member of the United States House of Representatives from Minnesota. He was born in Pittsfield, Illinois but moved with his father to Le Sueur County, Minnesota in 1854, where he attended the public schools and was also instructed by private tutor. He graduated from a business college in St. Paul, Minnesota. Later he studied law and was admitted to the bar on March 6, 1872 and began his law practice in St. Peter, Minnesota. He was elected city attorney and city clerk of St. Peter (1878 – 1898); served as prosecuting attorney of Nicollet County (1879 – 1889 and 1901 – 1903). He was a captain in the Minnesota National Guard. Elected to the Minnesota House of Representatives in 1889 and 1890; served in the Minnesota Senate from 1891 – 1895. He was elected as a Republican to the 58th, 59th, 60th, 61st, 62nd, 63rd, 64th, 65th, 66th, 67th, and 68th congresses, (March 4, 1903 – March 3, 1925). On April 5, 1917, he was one of 50 representatives who voted against declaring war on Germany. He was chairman of the powerful Committee on Appropriations in the 67th congress, but was an unsuccessful candidate for renomination in 1924. He resumed his law practice in Washington, D.C. and in St. Peter, Minnesota. He died in Washington, D.C. at age 80 and was interred in Woodlawn Cemetery, St. Peter. United States Congress. "Charles Russell Davis (id: D000093)". Biographical Directory of the United States Congress.